If that is true - and it is a controversial claim - it fulfils a more than 80-year quest to produce what many have said would be a wonder material. 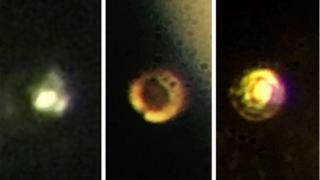 "It's the first time solid metallic hydrogen has ever existed on Earth," Prof Silvera told the BBC. The pair say the quantity of metallic hydrogen created so far is tiny - a speck that is less than the cross section of a human hair. But in time, they believe, ways could be found to boost its production. The intention was to pack the atoms of hydrogen so close together that they formed a crystal lattice and started to share their electrons - behaviour that is exactly that of a metal. "As we turned the pressure up, it went to a transparent molecular solid. And then as the pressure kept going up, it went black, and we think it goes black because it becomes like a semi-conductor and it can absorb light," Prof Silvera recalled on the BBC’s Science In Action programme. "And then we turned the pressure up higher and it started shining. It was very exciting. It's got extremely high reflectance. The reflectance we measured is about 90%. It's about the reflectivity of an aluminium mirror." It has to be said, however, that news of the Harvard experiment has already attracted a good degree of scepticism. "Complete garbage," is how Eugene Gregoryanz from Edinburgh University described the research. "Like everybody else who works with hydrogen at high pressures, I am appalled by what is being published in Science." That there is so much scepticism is natural. If what is being claimed pans out, it would represent one of the major physics breakthroughs of recent decades. It has been suggested for example that metallic hydrogen might be metastable; that is - once made under extreme conditions it would maintain its state even when brought back up to ambient pressures and temperatures. But all this is in the realms of speculation for now. First, it must be shown that the Harvard work can be reproduced. If that's possible - and some are saying that is a very big "if" - then more sizeable quantities of metallic hydrogen need to be created. "I understand that others in the DAC community have been rather sceptical (arguing that the apparent reflectivity might be coming from contaminants in the sample, the aluminium oxide coating on the diamonds, etc.). However, if they really have achieved nearly 500 gigapascals in the DAC it is not unreasonable to have observed a transition to metallic hydrogen,” commented Marcus Knudson from Sandia National Laboratories. "The scepticism here is probably a good thing, in that it will drive many groups towards attempting to reproduce this experiment. This publication will certainly incite the field. Again, if it holds up, this is an exciting result. I think in this case time will tell," he told BBC News. And Jeffrey McMahon from Washington State University concurred: "With respect to the tiny sample amount: Such experiments are performed in small diamond anvil cells. One challenge would be to make a larger quantity (at once); another, perhaps bigger challenge is to recover even the small sample (ie, remove it from the extreme pressures that it is under in the diamond anvil cell). "Whether the latter is possible is an important open question."